Happy Korean Liberation Day to you all! (Gwangbokjeol they call it here) The day celebrates the end of the Japanese colonial period in 1945. Unfortunately the weather is pouring rain on this holiday, making it a good day to catch up on my blog-posting! It's hard to believe that today only marks day 7 of my journey in Seoul...I feel like I have been here much longer. Every day has been mesmerizing for the senses, taking in the sights, sounds, and tastes of a new country. The first week in Korea has often been bewildering as I try to navigate language and culture barriers. Emotionally the week has oscillated between exciting highs and brief moments of exhaustion. I dove headfirst into the apartment search from the first day I arrived. Four realtors took me on a whirlwind tour of 33 apartments within commuting distance of my office, the Samsung Electronics building in the bustling Gangnam district of Seoul. The process felt a bit like when I rushed fraternities at MIT 12 years ago, which happened almost the moment I arrived in Boston. Pledging a fraternity with imperfect information is a poor idea and signing a two-year apartment lease in a brand new city seems like a poor idea as well, but I had no choice on the latter as I needed housing, so I tried to be as thorough as I could. The quality of apartments that my Samsung housing budget could buy me varied widely, from tiny cheap-feeling units in high rises lacking appliances to spacious "villa" style units in smaller walk-up buildings. With many new Samsung expat employees flooding the rental market all at once, I was in competition with many of my future coworkers for apartments, forcing me to decide rather expediently. Thankfully I now have a hold on a nice apartment in the posh Hannam-dong neighborhood, which I should be able to move into in a few weeks! Though apartment hunting has consumed much of my time here thus far, I have had some time to get out and acclimate myself with my new city. I've mostly explored the area around the office and my hotel, the bright glitzy neighborhood surrounding Gangnam Station. It's a little like Times Square with all its bright lights, restaurants and shops. Gangnam is an affluent and trendy area, perhaps the heart of new Seoul. The best part about being here so far, without question, has been the food. I will refrain from starting a Seoul food blog as I don't have a refined food palate, but I'm a big fan of Korean food so far. Anyone who loves grilled meats, soups, noodles, and (of course) kimchi is in heaven here. With a generous bounty of vegetable side dishes at almost every meal (complimentary in many restaurants), the Korean diet feels very healthy and I don't think I'm gaining any weight despite all the food I've been eating. Warning to my American friends: Much Korean food is spicy!! I definitely need to adjust my spice tolerance over the next few months. On the other hand, communicating has been a major challenge. I don't yet speak the Korean language or read the characters, and spoken English proficiency varies considerably here. Even those who you might expect to have strong English skills sometimes disappoint. Given the amount of American and British media permeating the airwaves and the fact that English teachers probably outnumber English-speaking tourists, I was expecting less difficulty, but it is what it is. In some cases I'm just getting by with smiling a lot, bowing my head, and uttering the few words that I have learned so far ("hello" and "thank you"). There's a silver lining to all this: more motivation for me to learn Korean! There has also been a natural amount of cultural confusion. Sometimes I forget to take my shoes off before entering a room, sometimes I'm watching others to learn the proper way to eat the food at a Korean restaurant. Doing laundry has been interesting -- I have a Korean washer/dryer unit in my hotel and a clothes drying rack that I haven't figured out how to set up yet. Many of my clothes came out all wrinkled and my attempt to rectify this with an iron and a tiny Korean ironing board didn't work so well. 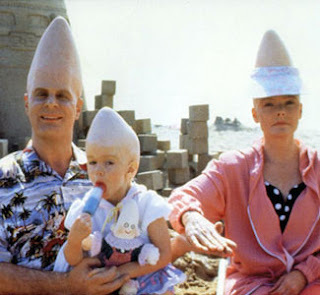 At times I feel like a Conehead, coming from another planet and trying to figure out how to do the little things in everyday life. France! We come from France! But all of these challenges are part of the fun of throwing myself into a foreign land. There will be more slip-up's and faux pas's for sure along the way, but I don't think there's any way that I can mess up too badly. Seoul is safe and clean, the internet is fast, the power stays on and the trains run on time. I'm staying patient and trying to observe and absorb as much as I can. Though life here may often be unclear, everything will be just fine. it's ok, everyone is a conehead sometimes! congrats on getting an apt - you should go on house hunters international!!! (a summer staple for me during my weeks of funemployment). enjoy the korean food - LOVE the bbq and sudonbujigae!